I am a coach, consultant, speaker and writer. Lump them all together and let’s call me a ‘social architect’. Social Architecture to me is about envisioning, designing, creating and helping to evolve the ways people work and live, and how they interact in the formal and informal spaces in which they carry out their lives .. work, recreational, purposeful and imaginative. Our notions of work, recreation, purpose and imagination are changing dramatically. Time and space are mutating in front of us as we encounter an always-on always-connected world. Some of this is exhilarating and promises great opportunity for self-expression and fulfillment. Some of this is daunting, annoying and chilling in its implications. I have been working for 35 years in the areas of organizational effectiveness, organizational design, and organizational change with a grounding in finance, financial management, and the social sciences .. psychology, sociology and economics. I’ve been studying the sociology of human social systems and the structures and dynamics of the organizations in which they work and play for the last 40 years. I also have a decent conceptual understanding of the cybernetic future in front of us. I believe I have an informed perspective on the core structural, psychological and behavioural challenges this future will present us. – and approaches for helping people and organizations design and carry out ‘change’. All of the past models and approaches are becoming restrictive and ‘clumsy’ in today’s networked environment. My dissatisfaction and curiosity led me to seek out more knowledge about the paradoxes and polarities of organizational structures and dynamics. I then invested a decade in learning about the dynamics and processes of approaches to co-creating an organization’s or a project’s vision, values, objectives and the ways to see, understand and touch tangible results. I learned about and practiced processes like Open Space, Future Search, Improv, Participative Work Design, Appreciative Enquiry, and Scenario Planning. Over the past 20 years I’ve learned a lot and gained lots of experience. The last 20 years has also brought us the Internet and the Web. While all of the previous study and experience has proved interesting and useful, I’ve also spent the last 15 years working at understanding the Web. Its structure and the social dynamics it engenders is forcing mutations in behaviour and culture upon us. 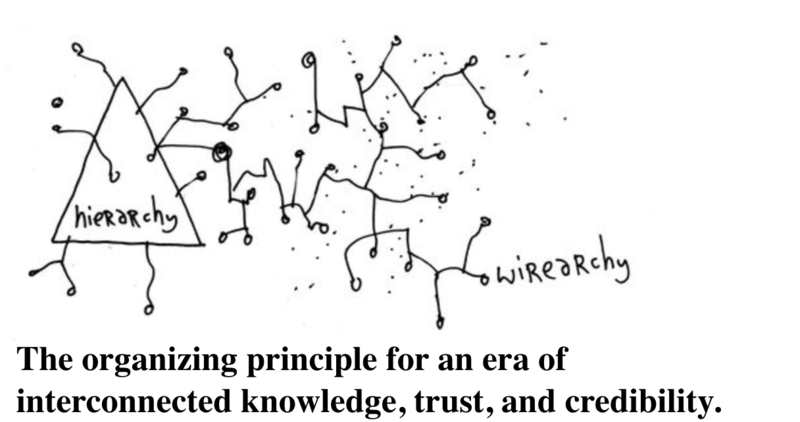 15 years ago I coined and defined the term and concept wirearchy. I believe we’re just at the beginning of a massive amount of individual and collective unlearning and re-learning what it means for humans to be in (perhaps more organic) interaction with each other .. and with our selves. All of our existing social institutions and the ways we interact with and use them will be changed. The co-creative concepts and I approaches I’ve been involved with for the past 15 years are essential approaches to untangling the complexities of interconnected life we’re now experiencing. We’re going into an uncertain future .. together, by necessity. We don’t know much yet about where all this is taking us, but it certainly seems like it has the potential to be somewhere very different. The Industrial Age may become to be seen as just a blip in human history. I don’t know. We’ll see. The arts and humanities are very important, I think. I also believe the past will be an useful guide to our future. I’ve also spent a fair bit of time travelling, cultivating deep friendships, skiing and (always) swimming. I am perpetually curious about what people do, why they do what they do and how they go about it. I have a strong experiential understanding of the various approaches and practices that have been used to design purposeful organizations. I hold a dedicated orientation towards humanist approaches that recognize that we humans find ourselves all in the same predicaments .. over and over again. But, there are more effective ways and less effective ways of doing things together. I have an informed perspective and some strong opinions on the issues. We need to find better ways and better reasons .. ways and reasons that honour each and every one of us whilst offering the individual and his or her close circles the possibilities of an expansive and fulfilling time on earth. I have also carried out a significant amount of volunteer work in the arts world over the years, notably in the disciplines of dance, film and the application of various media to community development initiatives. I can help people and organizations clarify critical issues and co-create with them plans to face a daunting future. I have been told, here and there, that I often ask good questions and can be an insightful conversationalist. I’m a coach and a consultant.